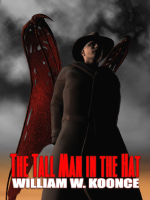 Tall Man in the Hat exposes a world where those who have sold their souls to the Prince of Darkness are given a second chance to come back into the fold of God. Soul Redeemers, a secret organization as old as the Christian faith, battle evil while sharing the story of Christ with these lost souls. To the west, in Marina Del Rey, a few blocks from trendy Abbott Kinney Blvd, a mansion looking north with Malibu and the Santa Monica Mountains in the distance, stood alone against the heat. The twenty-three-acre estate was in disarray—its groundskeepers fired—two riding lawnmowers abandoned on a trail of cut lawn that stopped like an unfinished highway, as if road crews had left their equipment at a dead end. Abandoned, other lawn tools (rakes, hoes, trimmers) lay about as if those wielding them had melted under the blistering sun, wisped up and away by hot vapors. There were other oddities: the outdoor pool had been drained and capped; and despite the heat wave, the Jacuzzi was as dry as the day its fiberglass shell was laid. Security lights, as big and luminescent as searchlights on a helicopter, spotted the perimeter. It was as if the house were packed up, shutdown—discontinued like an out-of-season hotel. Certain structural modifications had been made to the house, as exhibited by a front-loading commercial dumpster sitting on the mansion’s six-car garage driveway. Inside the dumpster, wood two-by-fours of odd sizes were stacked haphazardly like strands of broken fettuccine and discarded pieces of metal furring twisted and coiled, the longer pieces having sharp edges that peered over the dumpster like curious snakes. On the third floor of the mansion, in a room suited to be called an enclosed bunker, a desperate man coward like a frightened child behind newly installed three-inch metal walls. Despite the best efforts of an oscillating fan turbulently whirling in one corner of the room, he sweated. The apprehensive man had no idea what was going on in the world, not since he’d locked himself in his manmade steel enclosure several days ago. A strangled gasp escaped his trembling lips as he watched a wall clock tick silently away. The time was 6:30 PM. I’m dead, he admitted. Hypnotized, he stood underneath the clock and stared. Hopelessness filled his countenance with absolute resignation. For the umpteenth time he wiped nervous sweat from his brow. Despite the oscillating fan he could feel the fires of hell drawing close, licking his body like hungry tongues anticipating a scheduled meal. A meal, he mused bitterly, that’s what I am…that’s all I am. For weeks now—his mental equilibrium shot—he had teetered on the edge of madness, and would have gladly welcomed the disabling consequence of insanity, but things were all too clear, he understood exactly what his future held. The hangman’s noose has a way of bringing clarity of thought to the most bizarre of situations. His eyes blinked involuntarily with each passing minute, as if each sixty-second transition of time were accompanied by a gun’s loud report. What have I done, he asked. With a condemning grin: You sold your soul. How he regretted his fateful meeting with the tall man in the hat. Twenty years had transpired since that cursed meeting. Twenty years since he sold his soul. At the time it seemed like a good idea: the fame, drugs, women––all of it, all of everything. What a wild adventure it had been. But things change with time. Now it was time to pay up, and no power on earth would negate that fact. A rueful expression changed to a forlorn one, godforsaken and hopeless. The contract for his soul was firm, clear...final. Was it worth it? He didn’t need to answer; his shaking bones confirmed what he already knew. He jerked uncontrollably as another minute disappeared, watched the remnants of his life wind down like a worn-out spring of an antique watch; twenty years of fame and fortune simply winding down. It dawned on him that the analog clock would keep running long after he was dead. He had bought it at the beginning of the year; its’ shape––a brass techno head––was never a determining factor for purchase. He purchased it because of its synchronization with atomic clocks used by Global Positioning Systems. The clock was never wrong. One soul for a glorious singing career; wasn’t that the deal? The answer burned panic into his hazel eyes. An involuntary shrill of fear ran up his spine and caused him to shudder again. His eyes darted back and forth, searching for a way to escape, but he was imprisoned––a frightened man finding solace in an artificial womb of decorative wall panels over hardened steel. He moved behind that desk. As he sat, his stick-white legs seemed to buckle under the pronounced weight of his short frame. Through the years, he had become fat, but not obese; liposuction and tummy staples had ensured that. In the hall outside the triple-bolted three-inch steel door that was the only entrance to this man-made prison, another guard responded. This security man was the largest of the three guards. Broad in the shoulders and thick in the neck, he looked like a comic book hero with indestructible muscles. The guard’s resume stated he held a black belt in karate. His employer didn’t mind that the man did time for assault and battery, as well. “Yeah?” The guard had a deep voice that rumbled slowly, a confident voice.